StockTwits is a business startup founded by Howard Lindzon in 2008. Their product consists of a financial communications platform for the financial and investing community based on Twitter. They have about 230,000 users. All companies have to make money to survive. StockTwits is not yet a profitable company, and their strategy to make money is to sell data to financial institutions, corporations, and the mainstream media. 50 percent of their revenues originates from about 20 clients (including Google, Bloomberg, and hedge funds), but they have estimated the potential US market will be up to 1000 buyers. Twitter is often faster compared with regular news sources. If you remember the Costa Concorida accident when that boat sank just outside of an Italian island. Some investors did actually manage to make money from that accident because they learned about it on Twitter before everyone else. It's easy to follow what people are saying on Twitter about your favorite company. If you want to invest in Apple, it's easy to find what people outside of regular newspapers are saying about Apple. You can find trending stocks, that is stocks that people have begun to talk about more recently - compared with before, and might find a stock that is becoming popular. Something that is about to become popular - and that no-one else knows about is probably a good investment opportunity. You might find people you can follow on Twitter who are interested in the same stocks as you are. It will help bloggers to find articles they have written about a specific public company. A blogger can tweet a link to their article with an appropriate cash-tag. The problem with Twitter is the amount of information. If you are a regular investor, you might get overwhelmed by the amount of information you have to sort though each day. If you are going to use the service, you probably have to be someone who can dedicate a lot of time to it. 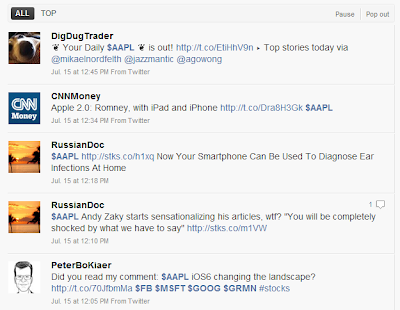 A couple of years after StockTwits was founded, Twitter created the same service with cashtags. 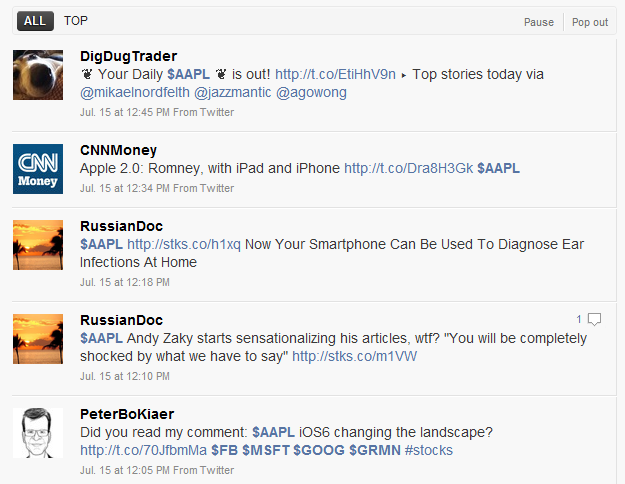 So you don't need to use StockTwits anymore to find information about the companies you are interested in - you can just click or search for your cashtag in the regular Twitter-stream (Apple: $AAPL).